Stumpwork can be found as early as the seventeenth century. Early designs depicted stories from the bible or showing the English Stuart Court. Depictions of people, castles, flowers, animals, insects and fruit were always popular. Once the young girls of the house had mastered their stitch sampler, then Stumpwork would be one of their next tasks. Girls as young as 11 years would start their Stumpwork designs. Parts of a Stumpwork design are hand stitched away from the main background fabric and then attached to the background fabric. Many different styles of stitching were used: Fine canvas was stitched and then appliquéd to the main fabric. Wired Needle Lace slips were stitched to produce clothing for the characters in the design or for flower petals, etc. Fruit and faces were sometimes made by covering wooden shapes. Many types of threads e.g., cotton, silk, wool, metallic, were used along side spangles, beads and metallic coils etc. Often the embroiderer would stitch her initials and year of stitching on the embroidery using small pearl beads. Designs were purchased from travellers that past the homes of the ladies or designs were sent from the cities. Designs were printed on thick white satin. The individual elements of the designs were easily recognisable, but the size of people, animal, flowers etc would not correspond to their true life size representation. The Stag deer could be smaller than the flower sitting next to it. The stars, sun, moon and rain where often found all in the same picture. Giving an innocence to the designs look. This traditional design above has many of the elements used in early designs. The woman's clothing, blue flower petals and mauve butterfly wing are Needle Lace slips wired and stitched using 1 strand of silk. The castle is tent stitched on canvas with 2 strands of silk then padded and appliqued to the Silk fabric background. The Stag is padded in places and split stitched, as is the pea pod. The antlers on the stag is wire covered with chenille thread. The leaves on the tree are made with Bullion stitches and the fruit are wooden beads covered in thread. The grey clouds are rows of buttonhole stitch. The sun, rows of couched metallic thread. The face has been hand painted. Star shaped sequins scattered around the design. Note, that a couple of the stars are missing. Be aware, if you stitch a box lid......people will want to touch it! This contemporary design has it's Needle lace clothing on the man and horse body stitched with Pearl 8 Cotton thread. The Mules body is one complete piece of Needle Lace (detached Buttonhole). The top of the wall is made of Raised Stem Stitch. The vine on the wall, has leaves which are wired onto fabric, the fruit is covered beads. The saddle cover is fine linen with buttonholed edging and a pulled eyelet border. The gold fish is padded, then gold metallic thread and open detached buttonhole is placed over the body. Behind the wall in the tree is a Stork, Possum, bug and snake. 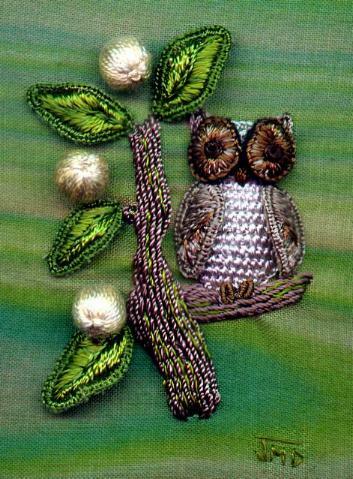 The tree and creatures are stitched in Chain and Split stitch. Design:20 x 23cm (8 x 9 inches).